Two years ago, when I moved out of a shared apartment and into my very own place, I had to let go of a fully-equipped kitchen and to be content with a spartan situation for the initial weeks. I had neither a microwave nor a kettle and the delivery of my new stove was delayed again and again. There was only me, a small pile of half-broken dishes and a mysterious waffle iron that had somehow found its way into one of my moving boxes. Since need is the mother of invention, I tried to put the seemingly limited appliance to as much use as possible. At first, I used it to grill sandwiches and wraps – a task the humble waffle iron passed with flying colors. I starting wondering what other dishes I could master and after sliding my first waffle-iron omelette onto my plate, I was unstoppable. These days, though my kitchen is much better equipped, the waffle iron still has a special place in it. Since I’m always on the lookout for more ways to put it to use, I just had to get in on a US trend called ‘waffling’. Simply put, it means everything ends up in the waffle – from mac and cheese to scrambled eggs to raw cookie dough! Call it what you like, we got out our waffle iron and put 9 of our favourite dishes to the ultimate ‘waffling’ test. At the risk of sounding over-the-top: Once you try this method there’s no going back to frying quesadillas in a pan! The advantage is obvious. The waffle iron evenly heats the filled tortillas from both sides and requires no fancy flipping techniques. A waffle iron is perfect for toasting paninis or grilled cheese sandwiches. Much like the quesadillas, it allows you to heat the sandwich evenly on both sides and gives you perfectly golden bread. Depending on the make, the waffle iron imprints a fancy pattern on your sandwich. Your panini grill won’t know how to keep up. We bet you’ve never prepared pizza bread rolls this fast! Simply spread out a piece of pizza dough, distribute the desired ingredients (our tip: lots of cheese!) and fold the edges together. After four to five minutes your pizza buns are ready to eat! You can use your favorite pizza dough recipe or, if you really want it to be the fastest meal ever, store-bought pizza dough works just as well. If you like cinnamon rolls, you will love the waffle-iron versions, which are a lot crunchier than usual – once you’ve tried them, you’ll have a hard time deciding between the classic and this new take. Simply prepare the buns as usual. The only thing to consider is the thickness of the dough once cut into rolls. A thicker cut will give you doughier rolls, while a thinner cut will give you the crunch we’ve been talking about. 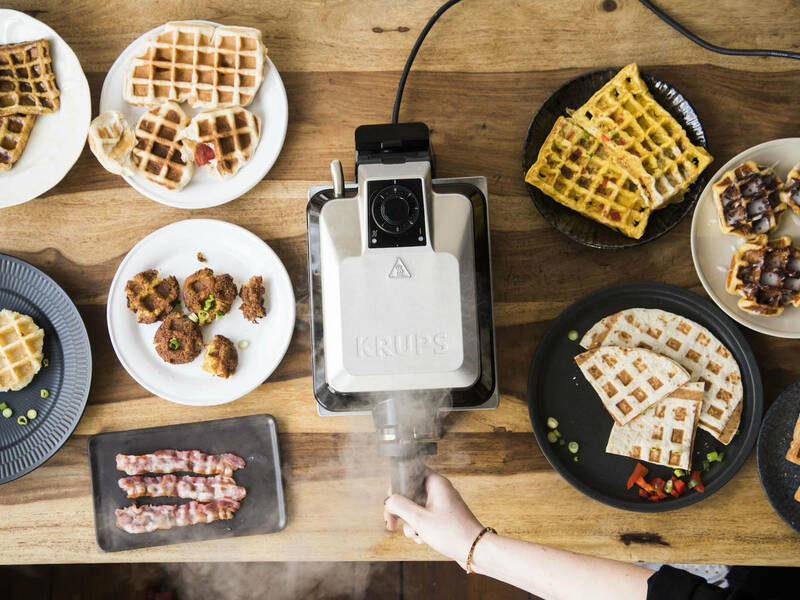 There are many ways to make crispy bacon: in the pan, in the oven – and yes, with the waffle iron! All you have to do is lay the bacon slices on the hot iron and cook for about 5 minutes on the highest setting. We were pretty sure the waffle iron could handle a frittata (a special form of omelette). Once again it blew us away. It could not have been easier: All you need to do is whisk the eggs with the ingredients of your choice, grease the waffle iron with a little butter and pour in the egg mixture. In less than five minutes, the frittata-waffle is ready to eat. French toast can be sweet or savoury, most often made from a slice of bread soaked in a mixture of milk and eggs and then fried in a pan. Could the waffle iron be a winner again? The answer: A clear yes! Thanks to the indentations made by the waffle iron pattern, there’s even more space to catch maple syrup, butter or fruit. Although you need a bit more patience, because the potato batter can easily flake off and stick to the pan if they are not completely cooked through. But, as always, with a bit of practice you’ll be a pro in no time. Tip: Make sure the potato mixture is really stiff. If it is too runny, the latkes may fall apart when you open the waffle iron. We saved the most surprising for last. With some hesitation, we poured our sticky pasta mixture into the waffle iron and held our breath for the ensuing two minutes. Not only did the waffle iron stay unexpectedly clean, it delivered your regular cheesy macaroni with next-level crunch. What extraordinary creations have you made in a waffle iron? Have you been successful in all attempts or do you keep on experimenting? Write to us in the comments and share a photo of your creation with the community!